“I am 5?5?, I am a weekend rider, nothing to prove here”.just love to ride. LOOOVVVEE IT!! Fits perfect in all the right places. Stylish, feminine and comfortable. ”	Love the adjustable clip at the waist. ”	Very flattering around the midsection. ”	Very breathable material. Kept me dry. No complainin’ here. It’s a great product! Ladies, I have found a favorite here”Absolutely recommend this brand!! This skort is great for those of us that are a little curvier. It fits like a hugging short but offers modesty. Terry Bicycles offers a wide variety of stylish, high quality biking gear for the girls. We can ride rough and still look cute!!! You must check out their site and see all they have to offer. It’s great to see more companies catering to the needs of the biking woman”Finally, some really cool stuff”..So many colors and prints to choose from”Check it out. You won’t be disappointed! I have a few friends that use these and absolutely love them. I think it looks a lot more flattering on most women than regular bike shorts. 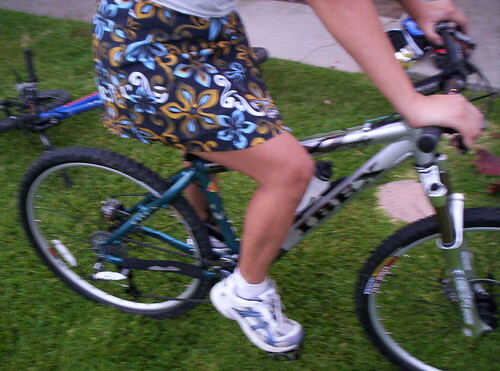 I got a Terry bicycle skort a few years ago. It’s great. I still get strange looks on my way in and out of work – bike commuters in Boston are few and far between – but at least I don’t have to walk by everyone in a pair of bike shorts. It’s also great when you want to stop and run some errands or stop to have a quick drink with friends on your way home. This skirt makes it very easy!